The true origin of the martini is draped in mystery! The heavy reliance on sweet vermouth in the original Martinez cocktail, plus the sweeter Old Tom Gin would have made this a truly sweet and very red drink. 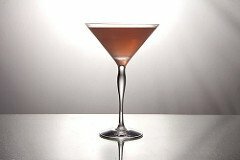 The transformation into what is considered a modern Martini happened gradually. This legendary drink has progressed significantly since those days. Vodka is substituted for gin and fruit or coffee flavours have entered the mix. 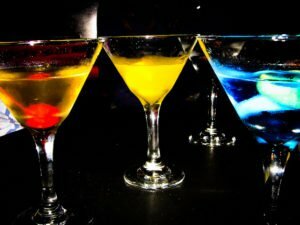 Martinis are key to any great bartending course. We outline the basics on gin martinis on Day #2 of our program. This also includes discussing how to make a Gibson martini… and making a martini ‘wet’. 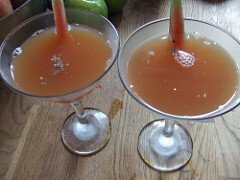 It seems like almost any vodka and juice cocktail can be mixed up as a sipping martini. 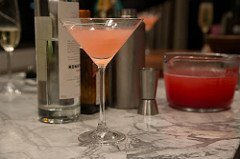 For those of you interested in only the drinks, check out seven of our favourite recipes outlined below. Note that these recipes are always open to a little modification depending on what your guests are interested in, plus what you might have for fresh ingredients! We’ve kept all these recipes to only two ounces of liquor, but that’s only so you can pace yourself while trying all of them. Here we have a cocktail mixed up with hints of juniper from the gin, flavours of orange and citrus plus a little pomegranate juice. 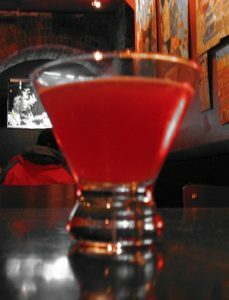 If you have added grenadine to your home bar, consider a small dash of the red sticky syrup to your cocktail as well. Chill the glass for at least 5 minutes with ice. The rim of the chilled glass needs to be coated in lemon juice and dipped straight into sugar to evenly coat the rim. The drink needs to be mixed and added directly into the ready to go chilled, lemon dipped, sugar coated rimed martini glass so it can be enjoyed fresh. Coffee lovers are always looking for a new way to ingest (or inject) that caffeine infused substance into their systems. 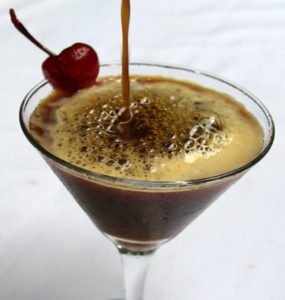 Of course if it’s just been a long day at work and you need a little pick me up while looking to take a little of the edge off… an espresso based mood elevator! The first step is to make your espresso. Make sure you chill it till absolutely cold. Chill martini glass with ice along with the espresso to ensure maximum chill (BEST IN FREEZER.) Pour all other ingredients except chocolate shavings into a cocktail shaker and give 4 good shakes. Strain into the chilled glass and add espresso. The drink should have froth, now lastly add your chocolate shavings as garnish and serve. Enjoy! Normally we wouldn’t recommend drinking anything blue. Save the blue tongues for kids and their lollipops. This pretty blue cocktail though is worthy of mentioning though. A touch of blue curacao and a few dashes of bitters really add complexity to otherwise a plain vodka cocktail. Chill Martini glass for at least 3 minutes. Add all ingredients into a cocktail shaker filled with glass, and shake 5 or 10 times. Strain mixture into your chilled glass and enjoy. This cocktail isn’t far from a typical crantini. Adding in a little extra of the sweet orange liqueur, and a dash of sugar solution creates a sweet and sippable cocktail. Chill martini glass in freezer filled with ice for about 3-5 minutes. Add ingredients into cocktail shaker half filled with ice and shake 20 seconds. Take chilled martini glass and pour ice out of it. Strain cocktail mixture into chilled glass, garnish and enjoy. One coffee-based cocktail wasn’t enough. 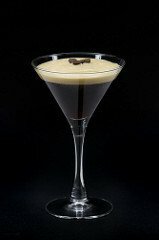 Above we talk about the Espresso Martini. This cocktail isn’t far off in how it is constructed. Without access to an espresso machine we outline, very quickly, how to whip up a cheaper alternative. Add vodka, Kahlua and 1/2 tsp of vanilla extract into cocktail shaker filled 1/2 way with ice. Fill with coffee mixture and garnish with chocolate shavings if you have a sweet tooth. The first step is to prepare your coffee mixture and your martini glass. Boil your water and chill your martini glass. By the time the coffee mixture is done your glass will be chilled enough. Once coffee is made add sugar to taste. Pour Kahlua, vodka, and vanilla extract into a cocktail shaker half way filled with ice. Shake 5-10 times and strain into your chilled martini class in the freezer. Top it up with your chilled coffee mixture. Garnish how you choose and enjoy. Vodka goes well with pretty much any kind of mix. For those early morning martini drinkers, combining the spirit with some of those breakfast juices can be both tasty, and shake some of the fog from last nights adventures. Fill glass with orange juice and grapefruit juice. Put high ball glass in freezer filled with ice to chill. Add 2 oz vodka to cocktail shaker filled with ice. Shake 20 seconds and pour into chilled highball glass. Add Orange Juice and grapefruit juice till glass is full. Add 2 or 3 ice cubes. Consider also making up this drink by adding juices along with the vodka in the shaker together. Shake well and strain your components into that chilled cocktail glass. What makes this a drink perfect for Monday’s? Our guess is there might still be some watermelon left over from the weekend BBQ or tailgate party. Rather than eat those fruity pink chunks alone, or in a watermelon salad, consider making yourself up a cocktail. Long weekend Monday’s are still great days for another cocktail too! Fill martini glass with ice and place in freezer to chill. Mash or thinly dice your watermelon and put into a cup. Slice a lemon into wedges to get ready to rim the glass once chilled. Add simple syrup, vodka, dices/mashed watermelon and ice into a cocktail shaker. Shake for a good 15-20 count. Use lemon wedge to rim the chilled glass (pour ice out of the glass first of course). Strain cocktail shaker mixture into chilled, rimmed glass and enjoy. And we just have to add in one final martini to enjoy. 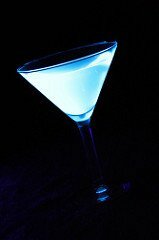 The Sour Apple Martini is a really simple Vodka-based Martini that has become popular over the last couple decades. The sourness and sweetness of a green candy-like sour liqueur can be diluted with a bit of vodka and lime juice to create an easy sipping cocktail. Shake well to marry the flavours. Strain into a chilled cocktail glass and garnish with a slice of green apple. We teach the Sour Green Apple Martini in our regular bartender training classes. The proportions of the drink can be adapted to pretty much any kind of vodka based martini… which is why we do it.